An 8-week interactive online course! Focusing is a process of allowing what is true for us, at levels deeper than what might immediately bubble up into conscious awareness. We do this by becoming aware of our bodies - of what wisdom, or truth, is literally embodied within us. This is a comprehensive Focusing Basics program that includes an 8 week phone course and a private guided Focusing session by the trainer to be scheduled prior to the start of the course. You'll gain a basic understanding of Focusing, and the ability to use Focusing by yourself and with a partner. "Thank you so very much for an exquisite experience / exploration / introduction into the world of focusing." "I found the program enlightening and helpful and I so appreciate your relaxed manner and humor!" "The one to one session gave me a sense of what to expect and reinforced I would be able to focus. It also helped me make a connection with you." "I was a bit skeptical about doing a class via the internet although I have participated in many interactive webinars. The interaction throughout the class was helpful. The practice sessions during and between classes were really helpful. The opening and closing attunements reinforced the process nicely....The assignments and "handouts" are excellent." "I liked hearing about the others who practice focusing in different ways. Zoom and Skype worked surprisingly well and boosted my confidence in using each modality. I thought the size of the class was about right, although we didn't interact as a group, each individual experience was rich and lively. I'm looking forward to the advanced practice class. Thank you for your work with us." "Thank you, Ruth for the wonderful class. Your guidance has been filled with compassion and helped me to be more in touch with my felt senses and feelings." "I'm so grateful for the work you do and for this class. I feel that it is helping me grow quite a bit, and helping me to do the work I need to do. I'm also grateful for our focusing group as everyone provides an encouraging and warm arena for practice. Thank you for the closing session as well, and to bringing more self compassion and kindness to ourselves." "Ruth Hirsch did a superb job of communicating and instilling the skills and values that are central to Introductory and Intermediate Focusing. I've been a teacher for over thirty years, and I feel that I have developed a keen sense of levels of pedagogical skill during that time -- and I would say that Ruth is indeed a 'teacher's teacher' when it comes to training students in Focusing." The course is intended for beginners and therefore there are no pre-requisites, except that each participant will have a private Guided Focusing session with the trainer prior to the start of the course. This session is included in the fee for the program. The class will meet weekly on Wednesdays beginning May 23rd, 2018 from 10:00am to 12:30pm Eastern Time (morning in the Americas; afternoon in Europe/Africa, night in Asia/Australia; Click this link for your time zone). The course ends on July 18th, 2018. Ruth will be using an excellent, simple-to-use video conferencing service. Details upon registration. is on the International Leadership Council of The International Focusing Institute. 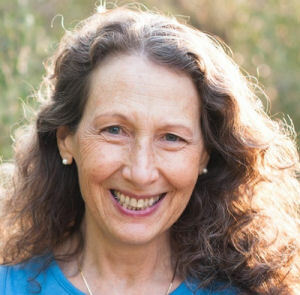 She specializes in balancing and bringing peace and insight to body, mind, heart and spirit, and delights in sharing Focusing with others as an individual life-enhancing practice, and as an adjunct to enhance the work of other healing professions. The Focusing Institute is approved by the American Psychological Association to sponsor continuing education for psychologists. The Focusing Institute maintains responsibility for this program and its content. CE credits awarded participants: 14. Click here for Course Objectives. Tuition: $850. Register online (below), or by calling (845) 480-5111, or by mailing a check (USD only) to The International Focusing Institute, 15 N. Mill St., Nyack, NY 10960, USA. To inquire about payment plans, call Elizabeth Cantor at (845) 480-5111. Member discount: Members of the Institute receive $25 off. If you aren't a member, become one here now, and then choose the member price at registration. Register for Focusing Basics and Focusing Intermediate-Advanced (at first convenient time following your Basics class) with Ruth Hirsch at the same time and receive a 10% discount on both. Select option upon registration below. Limited registration: Please register promptly -- we anticipate full enrollment. Guided Focusing session: Ruth will contact you by email soon after your registration to schedule the 50-minute Guided Focusing session. Refund policy: A full refund minus a $50 administrative fee plus the $140 session fee (if you've had the one-on-one guided Focusing session) will be given to participants who cancel one week before the class start date. Cancellations less than one week before the class start date are non-refundable. The International Focusing Institute reserves the right to cancel or re-schedule for insufficient enrollment (to be determined upon the close of registration) or for other unanticipated reasons. In such cases you will be given a choice of applying your tuition to future programs, or having the full enrollment fee minus $140 for the one-one session fee returned to you.